Jacob bullied a new girl at his school. So his own mum publicly shamed him on Facebook. When UK mum Terri Day Evans learned her son had picked on the new girl at school, she was furious. 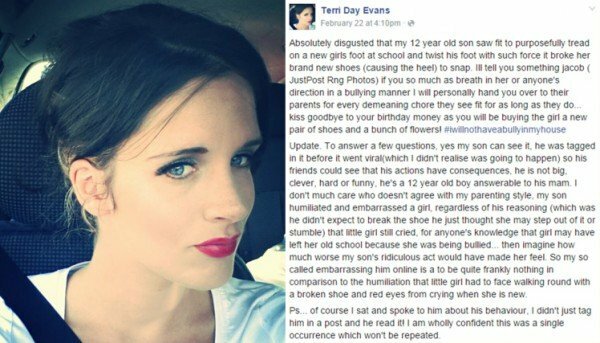 But while many parents might have simply grounded their child or taught him to apologise to his victim, Ms Evans went further – by tagging him in a Facebook rant condemning his “absolutely disgusting” actions. 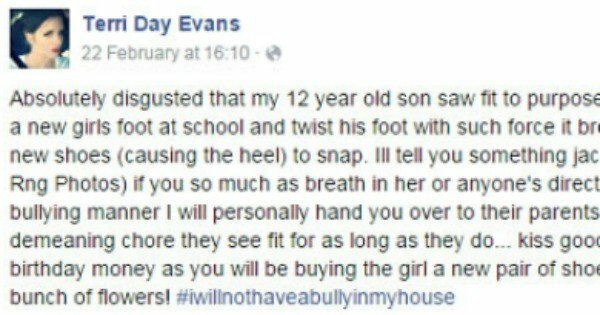 That post, which uses the hashtag ‪#‎iwillnothaveabullyinmyhouse, described an alleged incident in which Ms Evans’ son stamped on a classmate’s foot, breaking the heel of her shoe. The post has now gone viral — and it has sparked criticism by a number of commentators, who say Evans crossed the line by publicly naming and shaming her child. 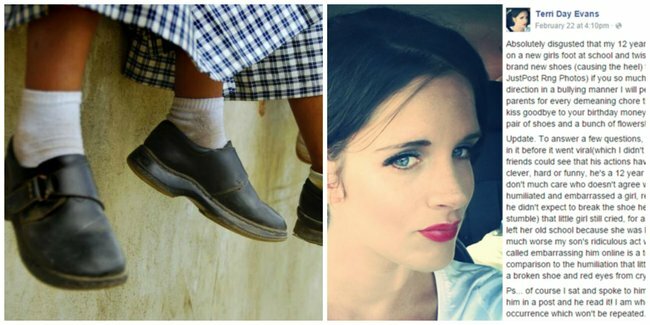 “Absolutely disgusted that my 12 year old son saw fit to purposefully tread on a new girls foot at school and twist his foot with such force it broke her brand new shoes (causing the heel) to snap,” law graduate Ms Evans wrote in the 22 February post. “I’ll tell you something… if you so much as breath [sic] in her or anyone’s direction in a bullying manner I will personally hand you over to their parents for every demeaning chore they see fit for as long as they do…” the divorcee continued. The strongly worded message was criticised by some readers as an overreaction. “Why extend the humiliation? Your poor son. This will haunt him forever,” commented Alison Kyle on Facebook. “This is an incredibly dangerous thing to do to any child,” Michael Crowley wrote. “Odd that she doesn’t see why he’s a bully in the first place. 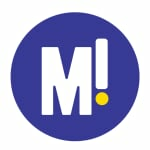 Monkey see, monkey do,” commented Carol Cunningham on the Metro website. When the post began to attract attention, Evans deleted her son’s tagged name from the post and edited the original message to explain she had spoken to her son before posting it. But she stood by her decision to write the social message in the first place, saying she needed to show her son that “his actions have consequences” and that she not swayed by critics. “Don’t much care who doesn’t agree with my parenting style, my son humiliated and embarrassed a girl, regardless of his reasoning…that little girl still cried” she wrote. The post was liked more than 54,000 times and has been shared by 11,200 people.